It’s hard to believe that CWC just completed our 12th Jumping for a Purpose event. 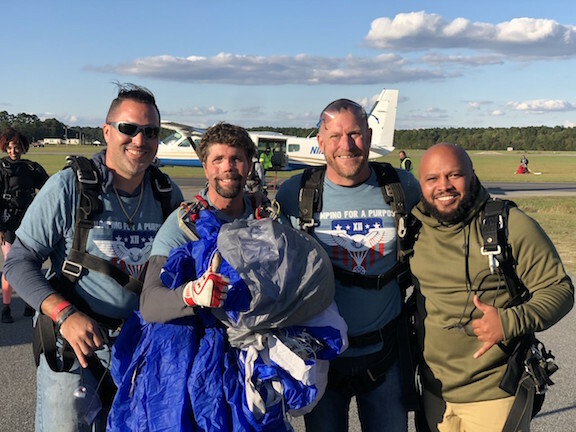 It seems like just yesterday that my good friend and fellow veteran, Matt Thompson, proposed the initial idea for Jumping for a Purpose and we pitched it to Skydive Suffolk. What an incredible journey it has been since then. We are getting close to having jumped almost 300 wounded warriors, caregivers and families of the fallen. We have gone from jumping at Skydive Suffolk to now also jumping onto the beach as part of Patriotic Festival with the USO. We have jumped not only American wounded warriors, but Danish and English wounded warriors, as well. We even jumped the Governor of Virginia, the Ambassador of Denmark, and multiple other VIPs eager to jump with our warrior and Gold Star VIPs. Above all, NONE of this could have happened without the TREMENDOUS SUPPORT of our sponsors, donors and volunteers. Not a single jump would have occurred without all of you. It is because of you that I watched a triple amputee Marine face his beautiful caregiver wife on the ramp of the plane, kiss his wife and jump out. I have seen the tears of Gold Star family members fall as they tell me they felt their son or daughter in the sky with them as they glided back to Earth under a parachute canopy. I have meet countless wounded warriors, who barely smiled when I first met them, land with a grin from ear to ear as they touched the ground as they tell me after this experience, they can do anything. They have gone on to do just that. I watched the graduates of our leadership and resiliency program, Overcome Academy, jump out as the culmination exercise of this two-week course. None of that would have happened without you and your support. So, on behalf of all our wounded warriors, caregivers, families of the fallen and this slow-mover who wanted to motivate and inspire them all, THANK YOU! Thank you for helping us inspire so many to live greatly and overcome all.